Anthony Snell, President of the International Blackcurrant Association since June 2016, opens the doors of his farm for us. Professionalism, perfection and experience in Herefordshire, UK. The first impression of a visitor at Windmill Hill in Western England will be “WOW”. 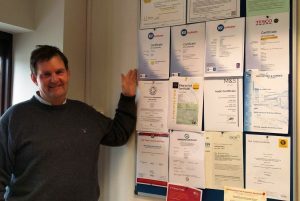 And it will also be the last impression, after having a deep look into Anthony Snell’s business. As it proudly shows on banners, Windmill Hill is where you will get the “berry” best from Herefordshire. 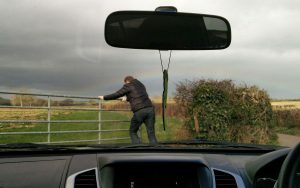 For many years, Anthony Snell and his wife Christine have been running the family business in beautiful hilly and green Herefordshire. Berries are their speciality, and among these: blackcurrants. 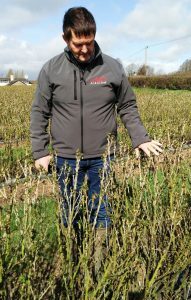 Anthony has a field manager for the strictly agronomic part of his business, but keeps an eye on everything – and knows everything about blackcurrants. 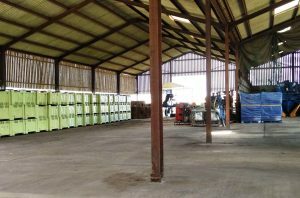 Anthony’s blackcurrant farm is of average size – and average in the UK means 70 – 100 hectares. 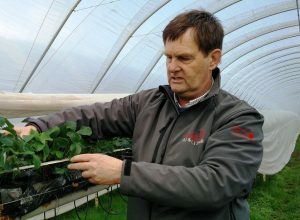 He is one of the 8 blackcurrant growers in Herefordshire, who are part of the British Blackcurrant Foundation. 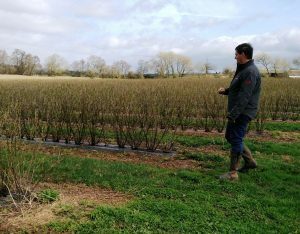 The other members of the foundation, in total around 40 blackcurrant farmers in the whole United Kingdom, grow their blackcurrants for the needs of Ribena. This represents 90% of the crop in the country. 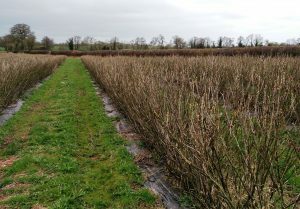 Ribena, a blackcurrant based British soft drink brand owned today by Suntory, contracts the blackcurrant growing for their needs with British growers. 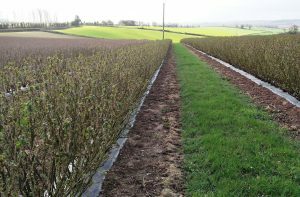 The contract between Ribena and the British Blackcurrant Foundation is the basis for good relationships between growers and processors. Here, the production corresponds to the needs, and everybody is happy: a certain price level is fixed approximately within a contract that lasts for seven years. Prices are, of course, adjusted after the harvest, according to the quality of the currants. 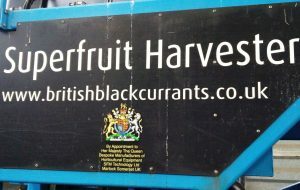 But it ensures the growers to sell their currants, and it ensures Ribena good growing conditions for “their” currants. 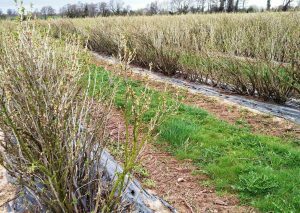 amount of blackcurrants, paying royalties for the amount of cuttings he plants. “Last year, I had to remove blackcurrants from some areas (variety Ben Hope), because I produced too much”, explains Anthony. 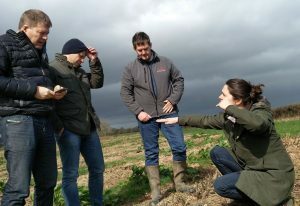 Five times a year, Harriet Roberts, agronomic adviser from LRS (Lucozade Ribena Suntory), visits every farmer. Together with a newsletter that she sends twice a month, this part of the contract. 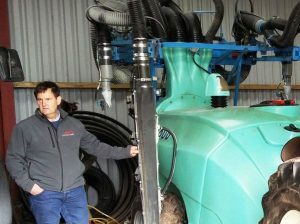 It helps the growers with professional agronomic advice. Where there is no place for “Ribena”-blackcurrants, Anthony grows organic. Blackcurrants of variety Ben Tirran represent 20% of the total area. Here, hand weeding and hand fertilizing is taking over from spraying and work with huge machines for the first 2 years of the plantation. The strict respect of organic growing methods will guarantee a good yield – which is half of the conventional yield. 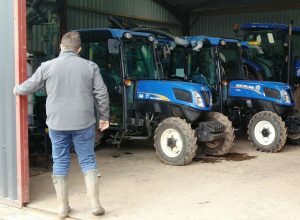 “In conventional growing, 7 tonnes per hectare is a good average”, says Anthony. 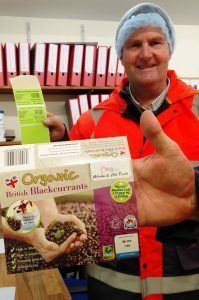 Windmill Hill sells its organic blackcurrants to companies who make organic yogurts or cordial, for example. But this is not all: Anthony has his own storage and packing facilities for IQF berries – and he sells them online. 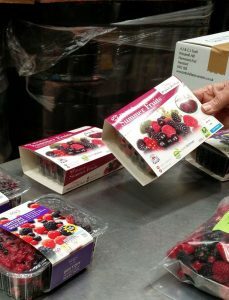 Apart from blackcurrants, Windmill Hill produces raspberries (40ha), a thousand tonnes of strawberries a year, together with some blueberries, chuckleberries and blackberries. During the harvesting season, around 300 seasonal staff join the permanent workers. They come from Bulgaria, Romania or Poland, and Anthony and Christine are very concerned by their well-being. 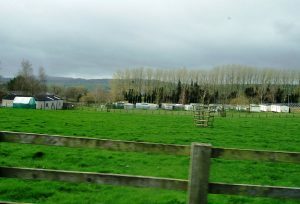 They provide accommodation in mobile homes on the farm for some of them, and they have their football and tennis facilities for spare time activities. Furthermore, hedges delimit the blackcurrant fields. 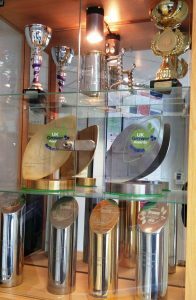 It is part of the environmental commitment from the Ribena growers. Hedges, flowers and wildlife are present everywhere on the farms. At the end of the tour, Anthony shows us his machinery. Not far from harvesting machines, tractors, sprayers and all the other farming material, some cows have their paddock. “This is Christine’s hobby”, smiles Anthony. 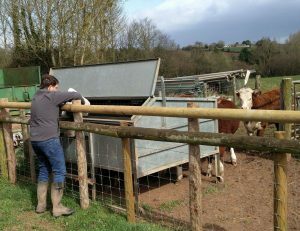 Because even though fruits have become an expanding activity in the Western Midlands, Hereford cattle is probably still its most famous export.